(kat'ă-rakt), Avoid the redundant phrase ocular cataract. Complete or partial opacity of the ocular lens. after-cataract a recurrent capsular cataract. atopic cataract cataract in those with long-standing atopic dermatitis. black cataract see senile nuclear sclerotic c.
blue cataract , blue dot cataract blue punctate opacities scattered throughout the nucleus and cortex of the lens. brown cataract , brunescent cataract see senile nuclear sclerotic c.
capsular cataract one consisting of an opacity in the lens capsule. 1. cataract present at birth, usually bilaterally; it may be mild or severe and may or may not impair vision depending on size, density, and location. coronary cataract tiny white opacities in a ring around the lens, the center and periphery of the lens remaining clear. 1. developmental punctate opacity common in the cortex and present in most lenses. The cataract is white or cerulean, increases in number with age, but rarely affects vision. 2. the most common senile cataract; white, wedgelike opacities are like spokes around the periphery of the cortex. cupuliform cataract a senile cataract in the posterior cortex of the lens just under the capsule. developmental cataract a type of small cataract in youth, resulting from heredity, malnutrition, toxicity, or inflammation, seldom affecting vision. electric cataract one occurring after an electric shock, especially to the head. Anterior subcapsular cataracts may form and develop within days; slowly developing or stationary opacities may follow a shock not to the head. glassblowers' cataract , heat cataract posterior subcapsular opacities caused by chronic exposure to infrared (heat) radiation. hypermature cataract one with a swollen, milky cortex, the result of autolysis of the lens fibers of a mature cataract. lamellar cataract one affecting only certain layers between the cortex and nucleus of the lens. mature cataract one producing swelling and opacity of the entire lens. membranous cataract a condition in which the lens substance has shrunk, leaving remnants of the capsule and fibrous tissue formation. morgagnian cataract a mature cataract in which the cortex has liquefied and the nucleus moves freely within the lens. nuclear cataract one in which the opacity is in the central nucleus of the eye. polar cataract one at the center of the anterior (anterior polar c.) or posterior (posterior polar c.) pole of the lens. pyramidal cataract a conoid anterior cataract with its apex projecting forward into the aqueous humor. radiation cataract one caused by ionizing radiation, e.g., x-rays, or by nonionizing radiation, e.g., infrared (heat) rays, ultraviolet rays, microwaves. secondary cataract one resulting from disease, e.g., iridocyclitis; degeneration, e.g., chronic glaucoma, retinal detachment; or from surgery, e.g., glaucoma filtering, retinal reattachment. senile cataract cataract in the elderly. senile nuclear sclerotic cataract slowly increasing hardening of the nucleus, usually bilateral and brown or black, with the lens becoming inelastic and unable to accommodate. snowflake cataract , snowstorm cataract one marked by gray or blue to white flaky opacities, seen in young diabetics. total cataract an opacity of all the fibers of a lens. toxic cataract that due to exposure to a toxic drug, e.g., naphthalene. traumatic cataract one due to injury to the eye. 1. A large or high waterfall. 2. A great downpour; a deluge. 3. Medicine Opacity of the lens or capsule of the eye, causing impairment of vision or blindness. an abnormal progressive condition of the lens of the eye, characterized by loss of transparency. A yellow, brown, or white opacity can be observed within the lens, behind the pupil. Most cataracts are caused by degenerative changes, often occurring after 50 years of age. The tendency to develop cataracts is inherited. Trauma, such as a puncture wound, may result in cataract formation. Less often, exposure to such poisons as dinitrophenol or naphthalene causes them. Congenital cataracts are usually hereditary but may be caused by viral infection during the first trimester of gestation. If cataracts are untreated, sight is eventually lost. At onset, vision is blurred; then bright lights glare diffusely, and distortion and double vision may develop. Uncomplicated cataracts of old age (senile cataracts) are usually treated with excision of the lens and either surgical insertion of an intraocular lens or prescription of special contact lenses or glasses. The soft cataracts of children and young adults may be either incised and drained or fragmented by ultrasound. observations Symptoms of cataracts include progressive, painless blurring and distortion of objects, glare from bright lights, and gradual loss of vision. Signs include a yellow, brown, or white coloring on the pupil and myopia. The crystalline lens of the eye becomes cloudy and opaque. Cataracts are identified by a complete ophthalmoscopic exam, including funduscopy and slit lamp examination. The primary complication is blindness. interventions Surgical removal of the lens is the primary treatment and is performed only after vision becomes compromised. Follow-up laser surgery is frequently needed to remove a secondary membrane that can form. Topical antiinfective drugs and mydriatic-cycloplegics are used preoperatively, and corticosteroids, antibiotics, and mydriatics are used postoperatively. Corrective lenses may be used to correct vision, and strong lighting may be used to enhance vision until surgery is performed. nursing considerations Before surgery, nursing care is focused on assessment and attention to self-care deficits related to decreasing vision. Preoperative care includes education about the surgical experience and lens implants and reduction of anxiety about impending surgery. Postoperative education focuses on proper use and instillation of eyedrops, prevention of infection, and activity restrictions. Lens opacity Ophthalmology Partial or complete opacification of the ocular lens or capsule, which impairs vision or causes blindness Classification Morphology–size, shape, location; etiology–eg DM, corticosteroids, trauma, und so weiter; time of occurrence–eg in elderly Clinical Double or blurred vision; ↑ sensitivity to light, glare Diagnosis Slit lamp microscopy Treatment Phacoemulsion, surgery. See Black cataract, Congenital cataract, Snowflake cataract, Sunflower cataract. An opacity of the lens of the eye, usually occurring as a result of aging, trauma, endocrine or metabolic disease, intraocular disease, or as a side effect of the use of tobacco or certain medications, e.g., steroids. Cataracts are the most common cause of blindness in adults. See: illustration; visual field for illus. At first, vision is distorted, particularly during night driving or in very bright light, causing light sensitivity (photophobia). As the cataract progresses, severe visual impairment develops. Ninety percent of adults over 65 have cataracts. Preoperative: The procedure is explained to the patient. An antiseptic facial scrub is performed. Mydriatic and cycloplegic eye drops are instilled to dilate the pupil, followed by lidocaine jelly and betadine drops prior to surgery; osmotic diuretics may be given to reduce intraocular pressure. An intravenous access is initiated, and antibiotics, a sedative, short-acting general anesthetic, and a local anesthetic are provided. Postoperative: The patient is instructed to wear a clear eyeshield if prescribed, and to call if experiencing pain, or loss of vision. Blurred vision the day of surgery is to be expected. Eye drops are to be placed as directed and the patient should not swim or strain himself. A postoperative checkup visit is scheduled for the day following surgery. Both patient and family are taught how to inspect the eye for redness or watering and to report these conditions as well as any photophobia or sudden visual changes; wash hands well and then to instill eye drops (antibiotic to prevent inflammation and steroids to reduce infection) as prescribed; and to maintain the eye patch and shield as prescribed by the surgeon. The patient should be taught to protect the eye from bright sunlight or glare by wearing dark glasses. The patient should not swim or strain himself or herself. A cataract occurring in the capsule of the ocular lens. A cataract that develops in the cortex of the lens. It has a spiky or spoked appearance on physical examination of the eye. A cataract in which the lens solidifies and shrinks. This stage follows the mature stage. An early cataract, too poorly developed to require therapy. A cataract occurring in the lens. Sufficiently dense changes in the anterior cortex of the lens to prevent the examiner from viewing the posterior portion of the lens and the posterior portion of the eye; that is, the entire lens is opaque and ophthalmoscopic examination of the eye past the lens is not possible. A cataract in which the central portion of the lens is opacified. A cataract between the posterior capsule and cortex. It is more common in younger patients, diabetics, and patients who use steroids. It tends to diminish near vision before it affects distance vision. A cataract caused by exposure to radiation, esp. from sunlight. A cataract occurring in an older person. A cataract with opacity limited to certain layers of the lens. Opacification of the internal focusing lens of the eye (the crystalline lens) due to changes in hydration and denaturation of protein causing irreversible structural changes in the orderly arrangement of the fibres from which the lens is made. There may also be aggregation of crystallin protein in the lens. These changes may be CONGENITAL, the result of trauma, or, most commonly, an apparently spontaneous age-related effect. Some experts believe that age-related cataract is caused by ultraviolet radiation in sunlight but others disagree. Progressive opacity or clouding of an eye lens, which obstructs the passage of light to the retina. n degenerative eye disease marked by the loss of transparency of the lens, resulting in an opaque, milky appearance behind the pupil. Partial or complete loss of transparency of the crystalline lens substance or its capsule. Cataract may occur as a result of age, trauma, systemic diseases (e.g. diabetes), ocular diseases (e.g. anterior uveitis), high myopia, long-term steroid therapy, excessive exposure to infrared and ultraviolet light, heredity, maternal infections, Down's syndrome, etc. The incidence of cataract increases with age, amounting to more than 50% in the population over 82 years. It is also more prevalent in Africa, Asia and South America than in Europe and North America. The main symptom is a gradual loss of vision, often described as 'misty'. Some patients may also notice transient monocular diplopia, others fixed spots (not floaters) in the visual field and others better vision in dim illumination. Cataracts can easily be seen with the retinoscope, the ophthalmoscope and especially with the slit-lamp, although depending on the type, one instrument may be better than the other. At present the main treatment is surgical. Extraction is performed for one of three reasons: visual improvement, medical or cosmetic. See after-cataract; juvenile idiopathic arthritis; biometry of the eye; crystalline lens capsule; Wilson's disease; blue field entoptoscope; glare tester; hyperacuity; crystalline lens; intraocular lens; leukocoria; clinical maxwellian view system; lenticular myopia; phacoemulsification; Down's syndrome; persistent hyperplastic primary vitreous. age-related cataract Cataract affecting older persons. It is the most common type of cataract and may take several forms: cortical, cuneiform, nuclear, mature or subcapsular. Syn. senile cataract. anterior capsular cataract A small central opacity located on the anterior lens capsule, either of congenital origin or due to a perforating ulcer of the cornea. See Vogt's sign. 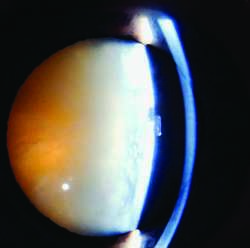 axial cataract An opacity situated along the anteroposterior axis of the crystalline lens (Fig. C3). bipolar cataract An opacity involving both the anterior and the posterior poles of the lens (Fig. C3). See polar cataract. blue cataract See blue-dot cataract. blue-dot cataract A developmental anomaly of the crystalline lens characterized by numerous small opacities in the outer nucleus and cortex, which appear as translucent bluish dots. The condition is very common and does not usually affect acuity. Syn. blue cataract; diffuse cataract; punctate cataract. brown; brunescent cataract See nuclear cataract. capsular cataract An opacity confined only to the capsule of the crystalline lens, anteriorly or posteriorly. It is usually congenital, although it may be acquired as a result of trauma or inflammation. central cataract See nuclear cataract. chalky cataract A cataract characterized by the presence of lime salt deposits. Christmas tree cataract A rare type of diffuse age-related cataract in which the opacities appear as highly reflective crystals. complicated cataract A cataract caused by or accompanying another intraocular disease, such as glaucoma, cyclitis, anterior uveitis or a hereditary retinal disorder such as retinitis pigmentosa or Leber's disease. Syn. secondary cataract. See cuneiform cataract; Leber's hereditary optic atrophy; retinitis pigmentosa; Down's syndrome; Fuchs' syndrome; rubella syndrome. congenital cataract Cataract occurring as a result of faults in the early development of the lens. Some may be hereditary, usually autosomal dominant. The cause of others may be chromosomal abnormalities (e.g. Down's syndrome, Turner's syndrome), carbohydrate metabolic disorders (galactosaemia, galactokinase deficiency), rubella syndrome, etc. The condition requires urgent treatment to prevent the development of amblyopia. See capsular cataract; lamellar cataract; nuclear cataract; polar cataract; sutural cataract. coronary cataract A cataract characterized by a series of opacities having the shape of a crown or ring near the periphery of the lens (Fig. C3). cortical cataract Cataract affecting the cortex of the lens. The opacities often begin as spokes or isolated dots or clusters forming the cuneiform or subcapsular types of cataract, but eventually the opacity spreads through the entire cortex. cuneiform cataract Age-related cataract characterized by opacities distributed within the periphery of the cortex of the lens in a radial manner, like spokes on a wheel (Fig. C3). See subcapsular cataract. cupuliform cataract See sub-capsular cataract. diabetic cataract Cataract associated with diabetes. In old eyes this type is similar to that of a non-diabetic person but in young eyes it is typically of the snowflake type. diffuse cataract See blue-dot cataract; Christmas tree cataract. electric cataract An opacity caused by an electric shock. cataract extraction, extracapsular (ECCE) Surgical procedure for the removal of a cataractous crystalline lens. The anterior capsule is excised, the lens nucleus is removed and the residual equatorial cortex is aspirated. The posterior capsule may be polished. An intraocular lens implant may then be inserted. See after-cataract; biometry of the eye; capsulectomy; intraocular lens; Elschnig's pearls; phacoemulsification; Soemmering's ring. cataract extraction, intracapsular (ICCE) Surgical procedure for the removal of a cataractous crystalline lens. The entire lens, together with its capsule, is removed. This procedure is rarely performed nowadays. See ligament of Wieger. fluid cataract Hypermature cataract in which the lens substance has degenerated into milky fluid. glassblower's cataract See heat-ray cataract. heat-ray cataract Cataract due to excessive exposure to heat and infrared radiation. Syn. glassblower's cataract; thermal cataract. See exfoliation of the lens; infrared. hypermature cataract The last stage in the development of age-related cataract in which the lens substance has disintegrated. See incipient cataract; intumescent cortical cataract; mature cataract; phacolytic glaucoma. incipient cataract The first stage in the development of age-related cataract characterized by streaks similar to the spokes of a wheel or with an increased density of the nucleus. See intumescent cortical cataract; mature cataract; crystalline lens; second sight. intumescent cortical cataract A stage of development of a cataract in which the lens, especially the cortex, absorbs fluid and swells. It may lead to secondary angle-closure glaucoma. 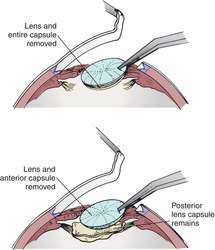 The cataract can progress to the hypermature stage in which case the fluid leaks out, resulting in shrinkage of the lens and wrinkling of the anterior capsule, leaving the harder nucleus free within the capsule. See morgagnian cataract. lamellar cataract A congenital cataract affecting one layer of the crystalline lens only. Syn. zonular cataract. mature cataract The middle stage in the development of age-related cataract characterized by a completely opaque lens and considerable loss of vision. See hypermature cataract; incipient cataract. morgagnian cataract A hypermature age-related cataract in which the cortex has shrunk and liquefied and the nucleus floats within the lens capsule. Degraded lens proteins may leak into the aqueous humour and cause phacolytic glaucoma. Syn. cystic cataract; sedimentary cataract. See intumescent cortical cataract. nuclear cataract An opacity affecting the lens nucleus. It can be either congenital or age-related in origin. It frequently leads to an increase in myopia (or decrease in hyperopia). In some cases it reaches such a brown colour that it is called brunescent cataract (or brown cataract). Syn. central cataract (Fig. C3). polar cataract A congenital opacity found at either pole of the crystalline lens. Anterior polar cataract may be flat or project as a conical opacity (pyramidal cataract) into the anterior chamber (Fig. C3). Posterior types may be associated with persistent hyaloid remnant (Mittendorf's dot). punctate cataract See blue-dot cataract. pyramidal cataract See polar cataract. senile cataract See age-related cataract. secondary cataract 1. Syn. for complicated cataract. 2. Syn. for after-cataract. snowflake cataract A cataract characterized by greyish or whitish flakelike opacities. It is usually found in young diabetics or severe cases of diabetes (Fig. C3). soft cataract Cataract in which the lens nucleus is soft. See crystalline lens. subcapsular cataract An age-related opacity located beneath the anterior or posterior capsule. It may spread from the periphery of the cortex like spokes on a wheel (cuneiform cataract). This is the most common type of cortical cataract. The opacities may also be confined to the posterior layers of the cortex with a granular or lace-like appearance (cupuliform cataract). Subcapsular cataracts are often the result of radiation exposure, age, toxic damage (e.g. from corticosteroids), or secondary to eye diseases (e.g. uveitis, retinitis pigmentosa). (Fig. C3). sunflower cataract See chalcosis lentis. cataract surgery See capsulectomy; capsulorhexis; capsulotomy; extracapsular cataract extraction; intracapsular cataract extraction; phacoemulsification. sutural cataract A congenital cataract in which the opacities are found along the anterior and/or posterior lens sutures. The opacities may appear Y-shaped or flower-shaped. The condition is often associated with Fabry's disease. thermal cataract See heat-ray cataract. traumatic cataract Cataract following injury to the lens, its capsule, or to the eyeball itself. It is commonly unilateral. Penetrating trauma of the lens causes rapid opacification of the cortex or even most of the lens contents. Concussion of the lens may result in capsular, subcapsular or cortical opacities. See Vossius' ring. zonular cataract See lamellar cataract. n an abnormal progressive condition of the lens of the eye, characterized by loss of transparency. Q. What Is a Cataract? My father has cataract in his eye, which interferes a lot with his vision. What is cataract? A. A senile cataract (or clouding of the eye), occurring in the aged, is characterized by an initial opacity in the lens, subsequent swelling of the lens and final shrinkage with complete loss of transparency. This condition as an effect on ones vision, and it is important to treat it early, as it becomes harder to treat as time goes by, and may eventually lead to blindness in that eye. Q. What vitamin through diet shall I take to prevent cataract and how can I help my dad? My father recently had a cataract surgery. This was his second cataract surgery. After this surgery I got scared as what’s going wrong with my dad and he had the cataract the second time. As per the doctor, my dad must be short in vitamins in his diet. He has been given some vitamin tablets. I know that cataract is genetic. I guess I may also have cataract in my old age. What vitamin through diet shall I take to prevent cataract and how can I help my dad? A. Yes, vitamins if not taken in required amount through diet may lead to vitamin deficiency. As deficiency in vitamin E -an antioxidant and vitamin B1 and B2 can lead to cataract. You must take them in required amount. Foods which have vitamin E are all vegetable oil, green leafy vegetables and egg. Cereals and fish are good source for vitamin B1 and vitamin B2 is surplus in milk and dairy products; eggs, cereals and green leafy vegetables. Q. I had cataract surgery with iol implant, and ever since I have awful light sensitivity. Any ideas? I can't go into a "super store" without my sunglasses. My eyes ache at the end of the day. My doctor says "I don't know!" A. May sound a bit silly question, but have you tried to consult your ophthalmologist (eye doctor, e.g. the one that performed the operation) about it? Cataract surgery, although considered very successful, isn't problem-free. Primary physician may not have the necessary specialization to deal with these subjects. Nuclear sclerotic cataract was the most common type 275(52. The second study, Survey in twelve countries reveals major gap in cataract awareness, looked at the results of the More to See survey involving more than 5,000 people over the age of 60. A dog with just one cataract is not normally a candidate for surgery, since he will still have good vision. Ciralsky notes that technology has advanced greatly over the last 10 years, both in terms of cataract instrumentation and intraocular lenses. Monofocal-lenses are the standard artificial lenses used in cataract surgery, but newer premium lenses designed Lo correct vision are also available. KEY WORDS: Cataract Surgery, Macular Edema, Nepafenac, Non-Proliferative Diabetic Retinopathy. Nuffield Health Cardiff & Vale Hospitals provide a dedicated hospital eye service at Cardiff Bay for the diagnosis, treatment and surgery for cataract and other eye conditions including glaucoma, age-related macular degeneration, diabetic eye disease, squints, corneal diseases and refractive conditions requiring laser correction surgery. The study, funded by the Wellcome Trust and Guide Dogs for the Blind, also found that environmental factors (including diet) influenced cataract more than genetic factors, which only explained a third of the change in lens opacity. The most important finding was that vitamin C intake from food seemed to protect against cataract progression. Lasers have been investigated for use in cataract surgery since the 1970s. Cataract refers to the clouding or opacity of the lens, the structure in the eye that focuses on an object for a clearer image. The present study will determine the prevalence of Cataract in an adult population of a rural community in Khammam.